In the midst of all the mad sewing for Costume College (next week! 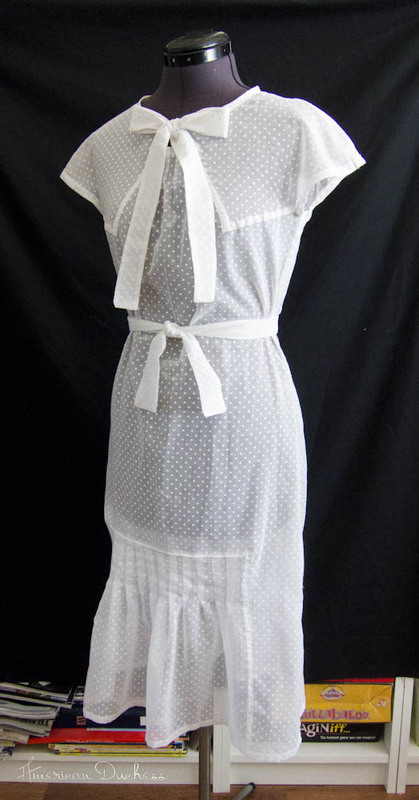 ), I thought I'd put together a simple "recharge" dress for a 1930s picnic tomorrow. I've made Vogue 2671 before, also in a sheer fabric, and I can't for the life of me remember why I didn't keep the dress, but I recall it being pretty and I liked it, a long long time ago. This time around I used a sheer polka dot I originally bought for a Regency gown, but found not suitable because the dot is printed rather than woven. What was inappropriate for the Regency was perfect for the 1930s, so I set to work on this pattern, planning to fell all the seams. Stupid pattern. It's not simple by any means. I despise Vogue's love of lapping seams and top stitching. It takes for flippin' ever and doesn't really look all that great. On the sheer, it was just a pain. This tubular dress doesn't really fit Millie the Dressform, but hangs much more nicely on a real body. Also, there is no slip on beneath the dress here. Despite my issues with Vogue patterns, though, the dress came out pretty decently. I remembered from the first make that the sheer fabric didn't really work with the button closure at the neckline, so I changed that to a big floppy bow tie. My alteration with the bow tie. Adorable! 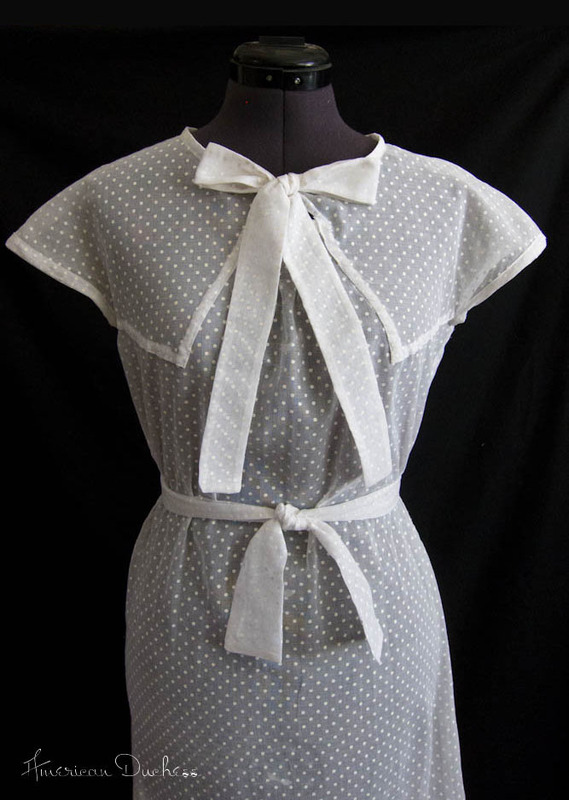 The dot is perfect and I love the neck bow. Well, I think it's fabulous. I think it looks super cute with the bow at the neck. Hope your picnic is lovely. oh, that is DARLING! definitely worth all the hard work! The dress turned out perfect and you look lovely. I really, really need this pattern in my life, in a size eighteen, oh if only it were possible, but it doesn't seem that there is one in existence! I just discovered your blog and I am in love! If you know of any way that I could make this dress in my own size, I would be forever in your debt! Oh my goodness, thank you! That's definitely a hefty price tag for a pattern, but really worth it as I am really, truly in love with the dress!